I wanted to bring this up here because I know that many of you can identify with my sadness. Many of you probably have heard that today is “Dress Like a Cow Day” at Chick Fil-A”. It seems to be all over Facebook and twitter with folks sharing their cute cow costumes. 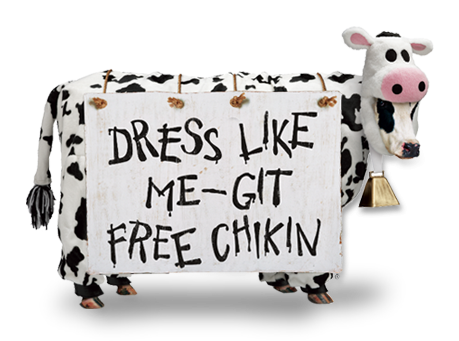 If you dress up like a cow you can eat for free at Chick Fil-A. Free food(especially yummy food like Chick Fil-A) is usually very well received in my family and we’d typically be the first in line. Yes, Chick Fil-A fries their chicken in Peanut Oil, and given that 2 of my kid’s can’t even smell the stuff we have to stay away from one of the most awesome fast food restaurants ever. It’s a major bummer! I do love Chick Fil-A, however, I love my food allergy kiddos more so I think we’ve made the right decision to stay away. Please understand, I am so happy for the people who are blessed to be able to enjoyone of the best chicken sandwiches/nuggets/strips ever. I also do not fault them for using Peanut Oil. It apparently makes for some delicious chicken, and they probably shouldn’t change a thing. Please just humor me as I mourn the loss of one of my favorite restaurants which we haven’t eaten at in over 8 years. That is all. I came across your site while looking for a allergen free version of meatloaf. It’s in the oven now and smells great! My daughter is allergic to gluten, dairy, egg, soy, nuts, melons, tropical fruits, preservatives and food colorings. I know how difficult it is! I read your post about chick fil a and had a question. I have a friend who’s daughter is very allergic to peanuts, but can have chick fil a. She said that because the oil is the fat and the allergy is to the protein, that it’s safe. Have you heard this? We won’t be trying that out, but I just was curious. Thanks for posting your recipes! I’m going to start blogging this fall to share ours as well. Can’t wait to see your blog! That is really, really sad. Kudos to you for not getting all “BAN PEANUT OIL” on us. I got so mad at the vegetarians making McDonald’s switch from beef tallow. The fries now taste like everybody else’s, and and they don’t crisp up the same way they used to. Why can’t some people just accept that there are some things they can’t do? We can’t eat fried stuff at places that use the same vat for fish and other things. It’s just the nature of food allergies! I just wanted to post, bc the fact is that 99% of allergics to peanut and/or soy are totally safe w the oil unless it is expeller pressed. I strongly feel this info is HUGE. My son avoided soy lecithin and soy oil for 4 years. He has had an anaphylaxis reaction to soy (milk which is a protein). He tests level 6 on skin and blood tests, YET, we challenged the oil and lecithin last fall and he now consumes those things often. Has really increased what he can eat and has lowered our grocery bill. I encourage you to at least consider asking your allergist about it. Allergy Alert: Epinephrine Injector Recall!